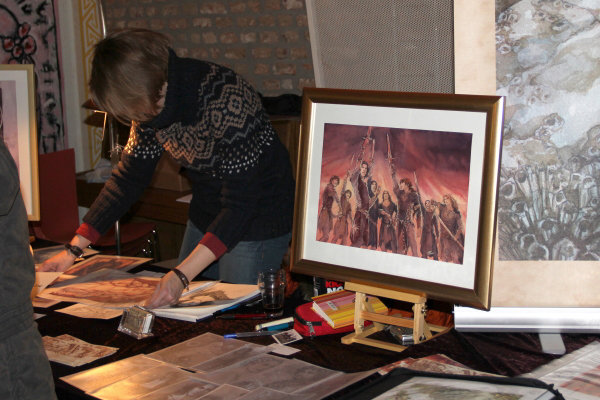 Last weekend was Hobbit Feest at Kasteel de Berckt in Baarlo, Netherlands. It was a wonderful and cosy experience (probably too cosy from the organisers’ points of view, as there were really not enough visitors). Though it was rather quiet, I loved it there – I met up with loads of Loughborough friends again, and made loads of new ones. Few visitors but loads of new friends – yes, that actually did work that way. I’ve been trying to analyse why exactly everyone at Hobbit Feest – visitors and vendors alike – were such great guys, and I have several theories as to that. Theory #1: Dutch people are cool. Yes, they are. So very much so. So relaxed, so friendly, so gregarious, so out- and easygoing. I think this has something to do with it, but the Germans I met there were just as nice, so that can’t have been all there is to it. Theory #2: Tolkien fans are a much nicer bunch than Fantasy fans at large (as seen at Ring*Con). That’s definitely true. Everyone whom I met at Baarlo had read the Hobbit and the Lord of the Rings; and those who had not read the Silmarillion were at least duly ashamed of themselves. XD And they loved to discuss their views as much as I do. Theory#3: I was sketching at my table. You may remember that one of the things I found so weird at Ring*Con was how people didn’t believe I was the artist of the stuff I was selling there. (Something I don’t understand. I think I fit my drawings.) Here, I always had a drawing in front of me, and people who passed by always acknowledged me. All of them smiled and said, “Those are great drawings!” Some then went on, in a friendly way. Most stayed to chat. 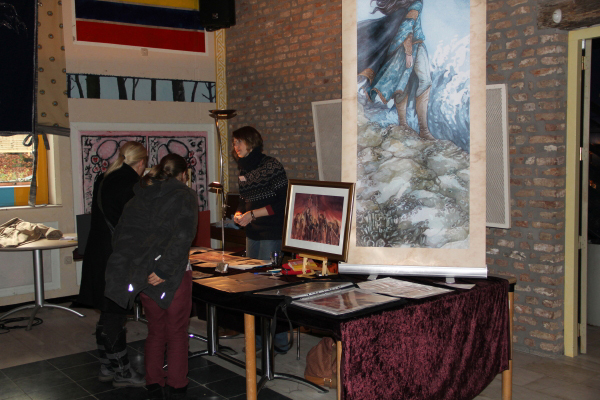 Many bought prints. I feel like an idiot for not doing that at Ring*Con! So they all really thought I was just sitting there behind a random assortment of prints – no wonder that wasn’t interesting. That sentence is just hilarious when you think about it. It implies I’ve printed out some nice piccies from the Internet and take them to a convention. It also implies that nobody (at least not, apparently, a youngish looking woman in a Norwegian sweater) is even able to draw like that. and the one one who can is… the Internet? I thought that mindset was rather funny. Interestingly, I’ve heard it before, from my very inartistic parents in law. 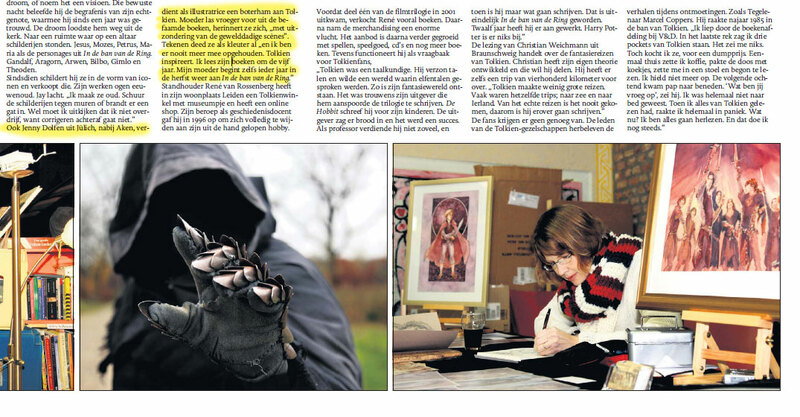 Talking about parents, De Limburger newspaper was there on Saturday, and I made it into today’s issue with a small interview and a photo! The text recounts how my mother read the Hobbit to me when I was a child, “leaving out the violent scenes” (not essentially true…) and how “Tolkien inspires”. That he does. To this day. And many another to come. So, aside from the many great conversations I had over the weekend, I did a workshop which was fun as well, though it bordered on a speed record that I was able to do it within one hour. Especially as I was talking English and German simultaneously. I also wallowed in the absolutely unparalleled luxury of having two, two days in which I could sit and draw! 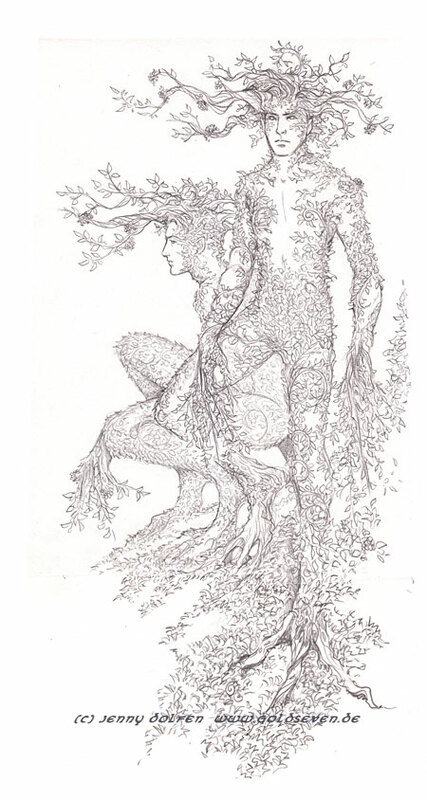 On the first day, I set out to do a pencil drawing (probably soon to be watercoloured) of the “Children of the Forest” sketch I made last week. On the second day, I gave Fëanor the glamour portrait that he has been demanding since… uh, 2004. I’m sorry, Curufinwë. I feel like treating this one with just a bit of colour too. 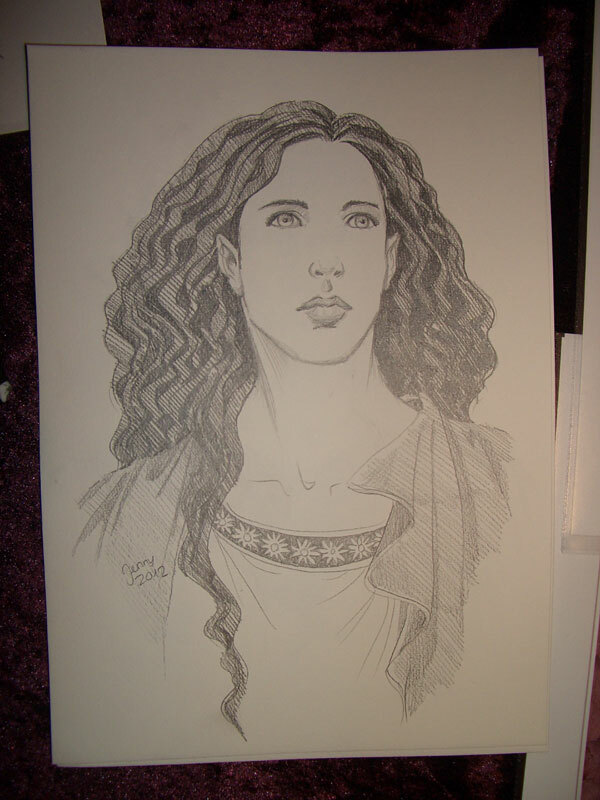 Later, I also drew a request sketch for Sarina, of Arwen. All in all, this has been an absolutely gorgeous weekend – I can’t wait for next May, when I’ll be at Tolkien Tag in Geldern! (Not a weird way of playing tag, by the way, but “Tolkien Day” in German). Feanor would be so proud. Fantastic drawings as always. I particularly liked the Children of the Forest sketch. Don’t you know!? It’s Google! The most talented artist on the net. It’s A3 in the original, and that’s a roll-up printed professionally. It was quite expensive, but it’s a great eye-catcher on cons! I think that means “Did you draw those directly on paper, or did you draw+scan+print them?” So in the first case it would be an “original” drawing and in the second case you would be able to make multiple copies of it. The follow-up questions are really important to get the real meaning of what they mean, then! Yeah, I understand what you mean about the Dutch – my sister is studying in the Netherlands, so we often go out to see her, and everyone – complete strangers, even! – are charming. Glad you had more fun with this one. I must say I do love your version of Feanor. He looks very… chiselled! 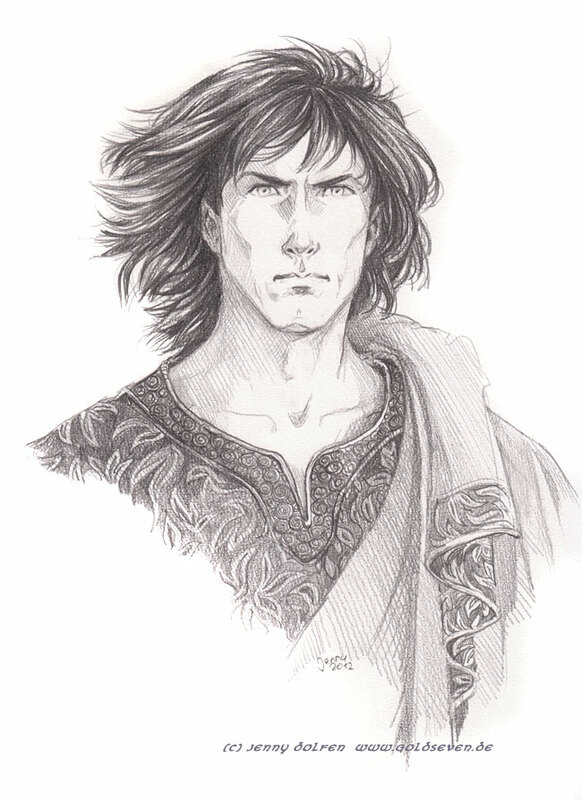 I like his haircut as well – personally, I’ve started getting a bit irritated with the really long-haired Feanor’s – I mean, he works in a forge. Having it long just wouldn’t be practical! your experience seems really pleasant, also from the way in which you talk about it; makes me crave to try and go to the next tolkien event! However, the idea that is not you who’ve drew these drawings is hilarious indeed. Internet is a very gifted artist… so much time dedicated to draw, and it’s still able to change its functionality a bit sometimes. Amazing! You have impressive artistic skills. What beautiful pictures! Well done! Lovely report, Jenny. Sorry I haven’t been up here sooner with comment. I think we all had a paticularly wonderful time, even if the crowds were small! Good food, good friends, good time. See you at “Tolkien Tag,” if not before! I might do Eärendil first – but the sevon sons riding will be my first personal project!